48 The Jews answered him, “Are we not right in saying that you are a Samaritan and have a demon?”49 Jesus answered, “I do not have a demon, but I honor my Father, and you dishonor me. 50 Yet I do not seek my own glory; there is One who seeks it, and he is the judge. 51 Truly, truly, I say to you, if anyone keeps my word, he will never see death.” 52 The Jews said to him, “Now we know that you have a demon!Abraham died, as did the prophets, yet you say, ‘If anyone keeps my word, he will never taste death.’53 Are you greater than our father Abraham, who died? And the prophets died! Who do you make yourself out to be?” 54 Jesus answered, “If I glorify myself, my glory is nothing. It is my Father who glorifies me, of whom you say, ‘He is our God.’ 55 But you have not known him. I know him. If I were to say that I do not know him, I would be a liar like you, but I do know him and I keep his word. 56 Your father Abraham rejoiced that he would see my day. 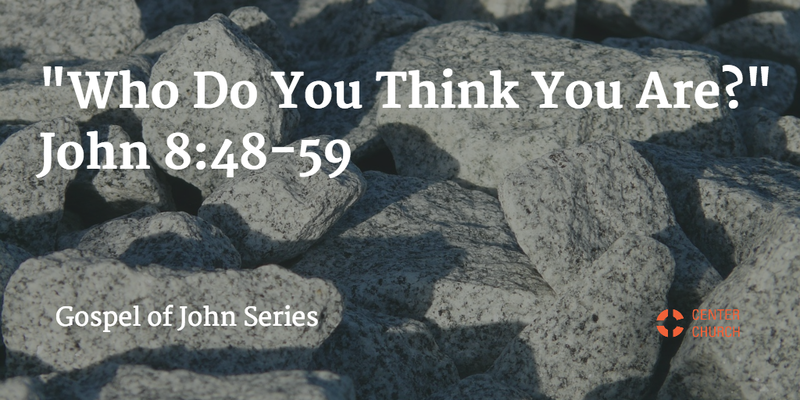 He saw it and was glad.” 57 So the Jews said to him, “You are not yet fifty years old, and have you seen Abraham?” 58 Jesus said to them, “Truly, truly, I say to you, before Abraham was, I am.” 59 So they picked up stones to throw at him, but Jesus hid himself and went out of the temple. The Jews ask Jesus “Who do you think you are?” Saying he is God, or the Son of God, is blasphemy and punishable by death (usually by stoning). Some people think Jesus is a liar because he doesn’t answer their prayers. Some people think Christians are lunatics because of the things they do based on their beliefs or despite their beliefs. If Jesus is the Lord, then does that mean that everyone else that does not believe is actually a liar or a lunatic? Jesus knows and keeps God’s word. 1. We constantly face accusations and opposition. The bad news is that we face accusations and oppositions everyday because we try so hard to control our own lives. 2. Jesus knows and keeps God’s word for us. The good news is that Jesus knows and keeps God’s word for us. In other words, Jesus is Lord who rescues us from the lies and lunatics ­ depressions and stresses. 3. We are known by Jesus and kept by Jesus’ word. You and I can live a life in the image of Jesus. As we know Jesus and God and understand how he lived our lives and suffered for us, the Holy Spirit will help us deal with the lies and the lunatics, so that we can be who we are, the children of Lord.